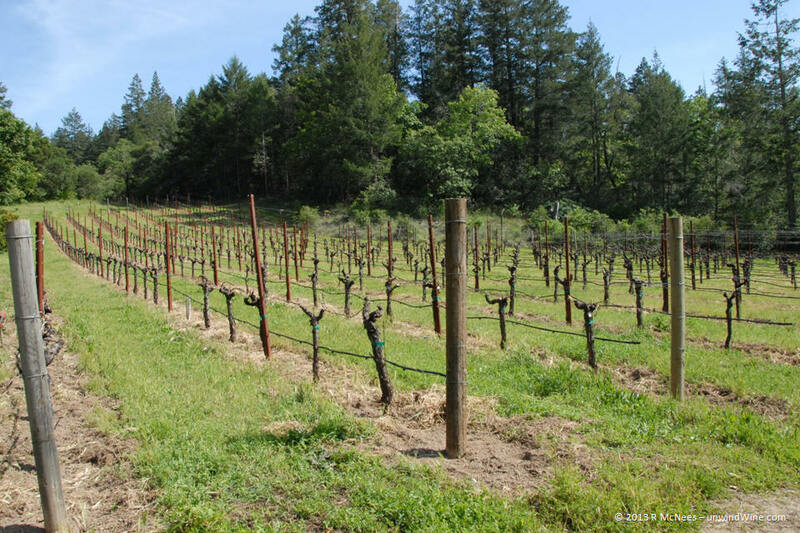 For our Napa Valley Wine Experience 2013, rather than resticting ourselves to one appellation, which is our normal approach, we focused on a few select producers that we've been collecting over the years but had yet to meet. We opened the weekend with Arns Estate Vineyards and Winery, a small artisan boutique producer of handcrafted Arns Estate Grown Napa Valley Cabernet Sauvignon. Situated on the lower tier of Howell Mountain on the eastern slope above the town of St. Helena, their wines are Napa Valley designation since the Howell Mountain appellation demarcation point is 1200 feet elevation, determined by the level the fog rises up the hill. Never-the-less, the Howell Mountain terrior is clearly evident in Arns Cabernet. 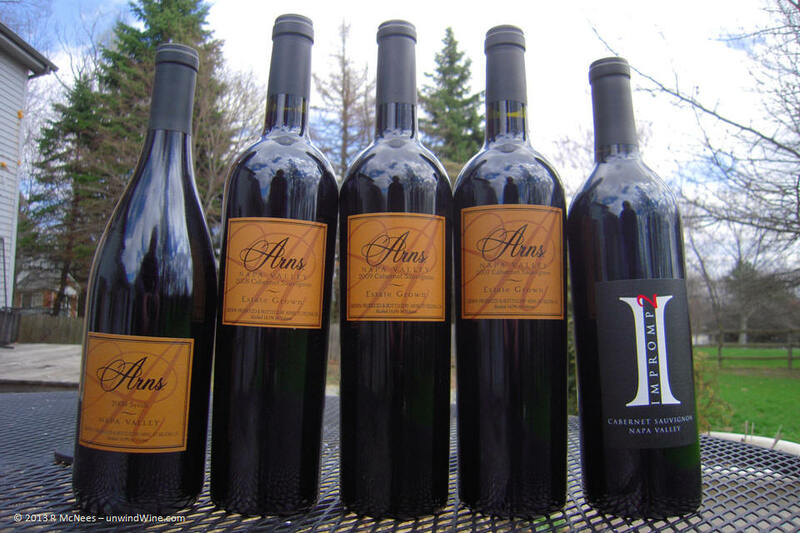 Arns Cabernet Sauvignon is produced by John Arns and Sandi Belcher - John managing the viticulture and Sandi tending to the winemaking. 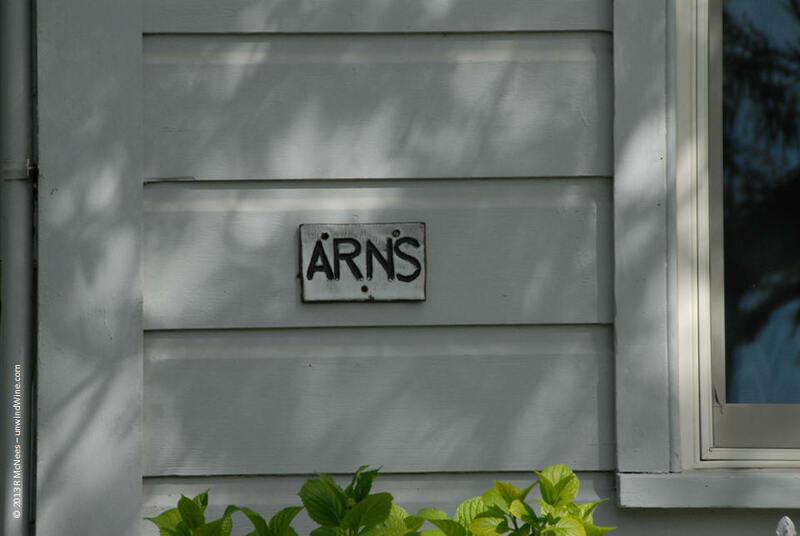 The property has been in the Arn's family since the 1950's when it was acquired by Arn's parents as an escape from the city down in Berkeley. The elder Arns planted vines in the 1960's to sell to local wineries. John and his brother, Steve took over the property and John continued developing the vineyards. 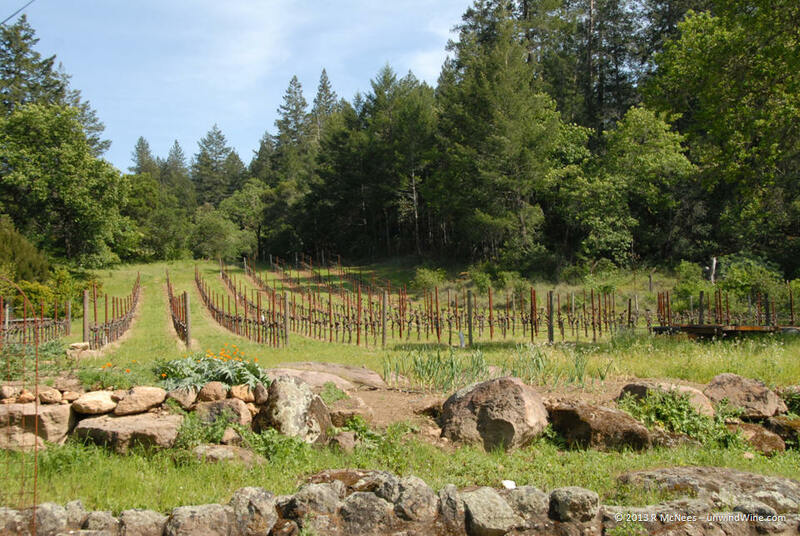 The Arns property was originally homesteaded in the late 1880’s by a German immigrant, then taken over by a stone mason whose work on homes and caves throughout the Valley and helped build the Culinary Institute of America in St. Helena with stones, shown left, quarried from the property. The previous owners of the property planted Zinfandel grapes.Today, ten acres of vineyards are sited across the 160 acre property of rocky hillsides, meadows and forests in ten different blocks consisting of seven different clones of Cabernet Sauvignon from Bordeaux and Napa Valley. The vines vary in age from 15 to 45 years. 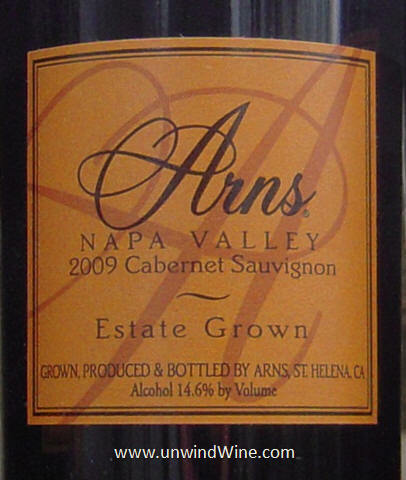 The ten blocks planted showcase the clonal differences and with each having varied exposure, the result reveals unique characteristics that contribute to the overall blend that is Arns Cabernet Sauvignon. The result of this combination of clonal selection, low yield, and minimal irrigation is fruit that is concentrated and intensely flavorful and a blend that has complexity, breadth and depth. 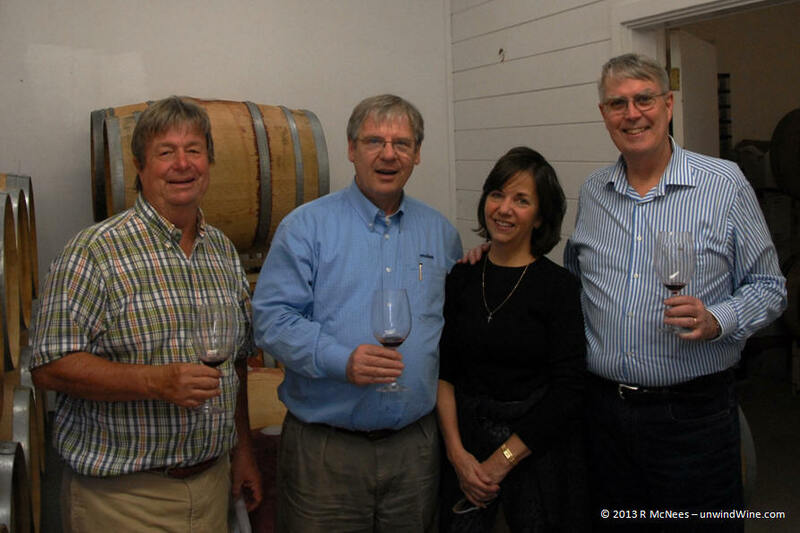 Ironically, we discovered Arns Cabernet Sauvignon on our frequent trips to Washington DC and our regular stops at Andy Bassin's McArthur Wines there from which we've accumulated a collection of Arns over the years dating back to the 1996 vintage. It turns out Sandi is from Virginia and developed the resale arrangement during her trips back home. 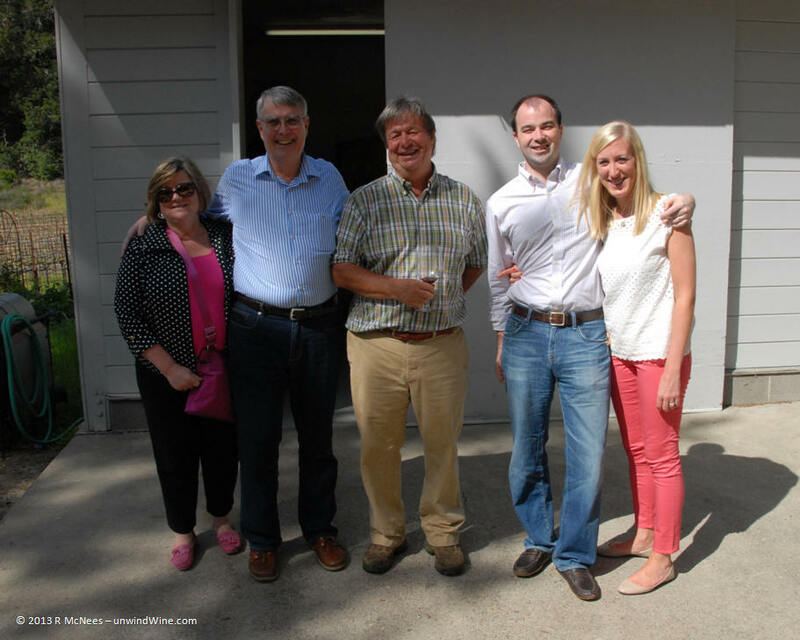 Since our Napa trips of recent years focused on distinct appellations per trip, we missed Arns over the years during our frequent visits to Napa Valley and mountain districts including Howell Mountain. It was great to finally connect with Arns and see first hand what makes up the artistry of their work. 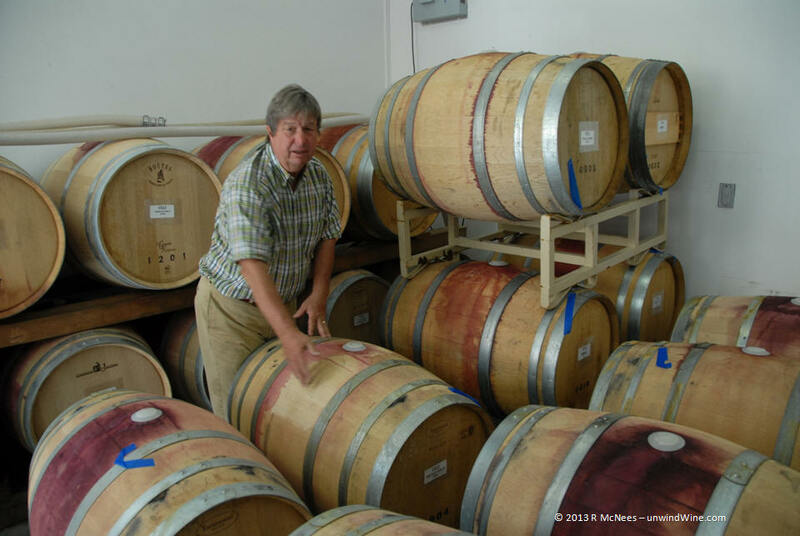 John Arns manages the viticulture, overseeing tending the vines for several producers around Napa Valley. This includes Syrah varietal vines that he planted at 1400 feet up on Pritchard Hill back in the early 1990's. The clones are from Joseph Phelps Vineyards. 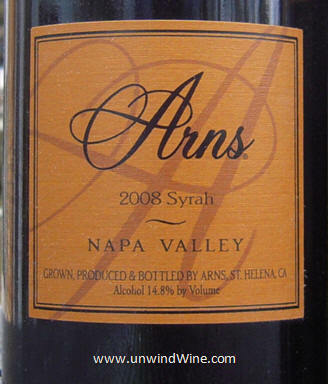 This provides fruit for this, the 5th vintage release of Arns Napa Valley Syrah. What a discovery and pleasant surprise! Readers of this blog know we love big full throttle Syrah/Shiraz which comprises a third of our cellar behind Bordeaux and Napa Cabernet. We didn't expect to find one at a Napa mountain fruit Cab producer. Moreover, ironically, we also spent an afternoon up on Pritchard Hill this Napa trip. The rocky terrain of the mountain elevation with the long warm growing season results in powerful but polished, forward flavors of black berry and hints of blue fruits, layers of anise and cassis with hints of mocha and clove, violets, leather and olive on a long lingering firm but silky tannin finish. This is more like a big Southern Aussie Shiraz. Only 65 cases of this are produced. Tasted at the winery, purchased some and shipped it home, tasted again... need to buy more! This is the best Arns I've tasted, most likely indicative of the vintage rather than the fact I held some of them for more than ten years before tasting. 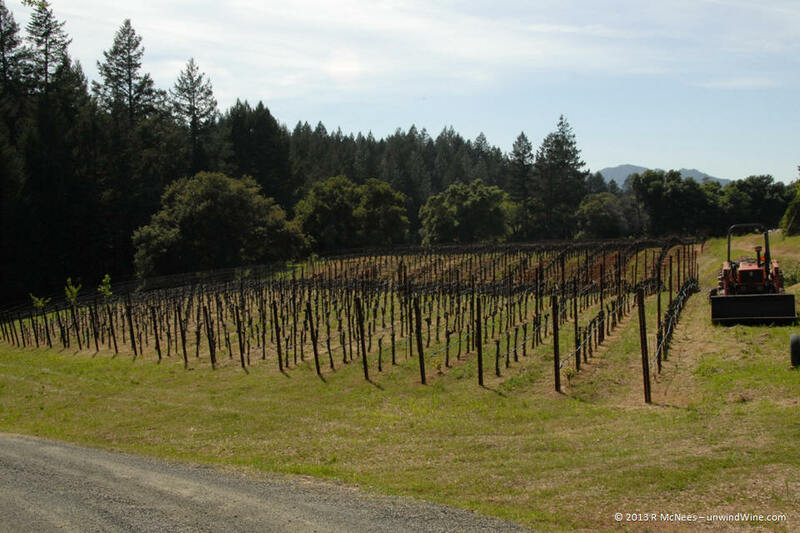 While this is Napa Valley appellation, there are traces of Howell Mountain terrior apparent. Dark inky purple color, medium to full bodied, vibrant forward black berry, black currant and Bing cherry fruits accented by a soft clove, hints of mocha, anise, tea and tobacco spice box and oak on the lingering smooth nicely integrated polished tannin finish. In addition to the current 2009 vintage release, there are still a few bottle remaining from the 2007 and 2008 vintages which allowed us to obtain a mini-vertical of three vintages. 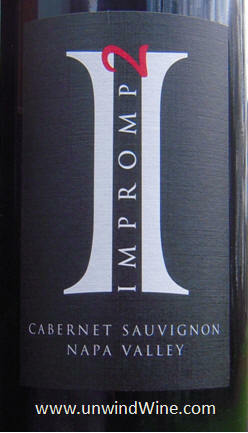 This Impromp2 is a multi-vintage blend of wine from the vintage barrel selections remaining from the various blocks from the 2005 – 2009 vintages, wines that were not blended into the Arns Estate Cabernet. Comprised of small lots from the earlier and more recent vintages set aside for this special blend it provides a melange with unique character and flavors. A pleasant drinking wine, this lacked the intensity and focus of the flagship Estate Grown Cabernet but its a unique tasting experience on offer directly from the producer. Medium bodied with a elements of black berry, black currant and black raspberry fruits with a melange of flavors - cherries, anise, mulberry, and hints of chocolate and spice complexity with a moderate finish. Arns' current releases on offer. Vines set amongst the Howell Mountain forests. John Arns in the Chai.